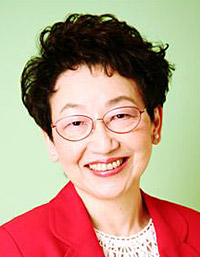 A Japanese politician and diplomat, who served as the first woman who became Minister of Foreign Affairs of Japan from 2002 to 2004. Yoriko Kawaguchi is now a member of the House of Councilors Senate and Deputy Chair of the Policy Research Council in the Liberal Democratic Party (LDP) of Japan. Prior to her current position, she has served as Minister of Environment, and Special Advisor to the Prime Minister, responsible for foreign affairs. During her 30 years career at the Ministry of International Trade and Industry (MITI), Japan. She had also served in positions such as envoy to the Embassy of Japan in Washington D.C. and an economist at the World Bank. She is a graduate of the University of Tokyo (BA in International Relations) and Yale University (M.Phil. in Economics) in the US. Since 2005 she has served as the chairperson of the Asia-Pacific Forum for Environment and Development Phase II (APFED II), and has held positions such as Member of the Club of Madrid/UN Foundation High-level Task Force on Climate Change and Advisory Board Member of the Energy and Climate Change Working Group, Clinton Global Initiative. Copyright © 2013 Asian Peace and Reconciliation Council (APRC).